Seeded No. 2, Dalma Galfi was within two points of elimination in her first round match against American wild card Alexandra Sanford. Down 5-3, with Sanford serving at 30-all, Galfi broke back and won the next three games to keep her hopes for a junior slam singles title alive. In her five matches since, Galfi didn’t drop a set, using a knack for winning the big points and her serve to close out match after match, including in her 7-5, 6-4 win over American Sonya Kenin in Sunday’s final. The turning point in Sunday's final came with Galfi serving at 4-5 in the first set. A double fault at 30-40 gave Kenin her first set point, but Galfi saved it with a forehand volley winner. A good return by Kenin earned another set point, but Galfi hit an ace to save that one and closed out the game with another ace. Serving at 5-all, Kenin netted a forehand to make it 30-40 and Galfi, who was 4 for 4 in break point conversions, blasted a backhand winner down the line and held at love for the set, finishing with an ace, one of six she hit in the first set, all seemingly at important points. Kenin knew it was crucial to hold her own serve, but although she won the bulk of the long rallies, she was not able to match Galfi’s ability to hit a big serve when she got in trouble. Broken in the first game of the second set, Kenin immediately broke back, but at 2-2, she double faulted on break point and Galfi had control of the match. Galfi consolidated the break with yet another ace on game point and served out the championship, the first singles title for Hungary in US Open Junior history, with a second serve ace. The sparse crowd on court 5 at the start of the match grew sizable once the women’s doubles final was complete, and they reserved their loudest applause for the American. 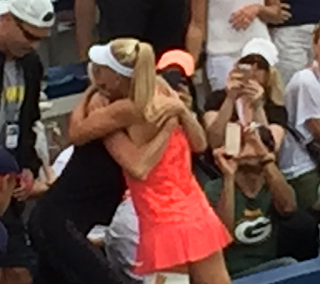 But Galfi had her own cheering section—her mother, father, sister, uncle, her agent and his son, and her coach, former WTA star Andrea Temesvari. Galfi has been working with the Hungarian, who reached No. 7 in the world in 1984, for just a few months, yet credits Temesvari with a major impact on the mental side of her game. Temesvari also was able to help calm Galfi’s nerves before taking the court for her first junior slam final. Unlike many junior slam champions, Galfi is not moving exclusively to ITA Pro Circuit/WTA events. Kenin, although disappointed with the loss, gave credit to Galfi for her level of play in the final. 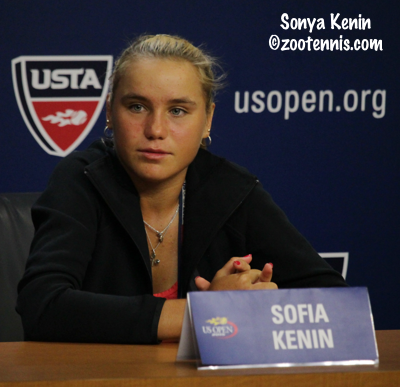 Kenin is planning to defend her Orange Bowl title and continue to play a mix of ITF Junior and Women’s Circuit events, including three USTA Pro Circuit events in October—two $25,000 events in South Carolina and a $50,000 tournament in Georgia. Galfi has no specific celebration plans, but already has a place in mind for her trophy.